Wall Street has set the earnings bar extremely low for Q1. This paves the way for a rally based on consensus beating results. Investor sentiment is still extremely cautious, which supports the bull. First quarter earnings will begin to be reported in just a few days, and already, Wall Street is nervous. With expectations high for a disappointing batch of corporate profits, many investors are preparing for the worst. Defensive sectors, especially utilities, have seen increased inflows while riskier industry groups are shunned. But as I'll argue in today's comments, the worst has likely already been discounted by the market, which paves the way for upside earnings surprises to have an outsize influence this month. By the end of the latest earnings season, investors should expect to see the major indices at new highs. This market has really been dominated by a rate narrative. Interest rates have come down materially over the course of the year. And, that has buffered stocks against some worries about earnings. But once you have to face the actual earnings results, I think the story is going to change." This is a belief which is widely shared among analysts and is, therefore, not a shocking revelation to most investors. Indeed, investors have largely known about the Street's poor earnings expectations for several weeks now and have already steeled themselves for it. One way that investors are hedging against a potentially disastrous earnings season is by piling into the stocks of defensive-oriented sectors. The utilities come to mind, with the Dow Jones Utilities Average (DJUA) rising 14% from its December 2018 low in the first quarter of 2019. The ultra-conservative utility trade isn't a recent phenomenon, however. For the better part of the last year, the utilities have been in favor among defensive-minded investors who have consistently been afraid to fully commit to the equity bull market. Shown here is the Invesco DWA Utilities Momentum ETF (PUI), which provides an idea as to the extent of investors' demand for safety. Yet another defensive sector which has been favored by investors as earnings growth fears proliferate is real estate. The Vanguard Real Estate ETF (VNQ) has significantly outperformed the S&P 500 Index (SPX) so far this year, a testament to the desire for safety among widespread uncertainty. The outperformance in real estate equities also underscores the lower interest rate environment, which in part has been driven by strong demand for the safety of U.S. Treasury bonds. On that score, the yield on the 10-year note has plummeted to its lowest level of the last year as investors flock to the bond market while eschewing equities. With yields falling and bond prices rising, investors have clearly "voted with their feet" in expressing their preference for bonds over stocks. 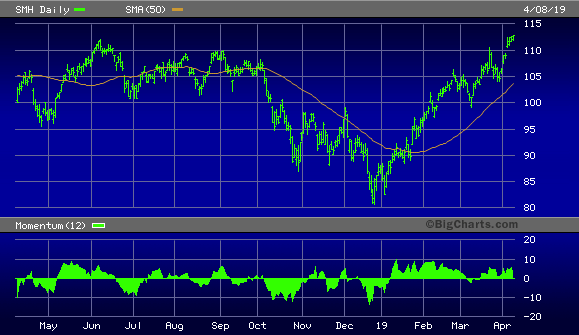 The iShares 10-20 Year Treasury Bond ETF (TLH), below, provides an illustration of this. 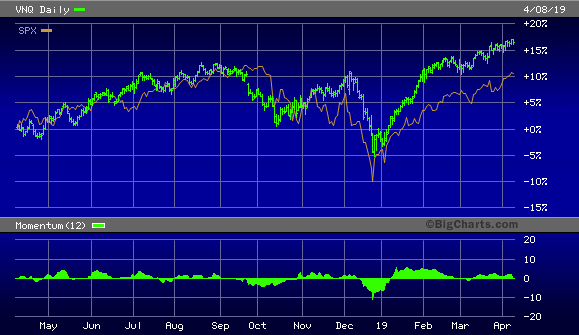 As you can see here, TLH is in a conspicuous relative strength position versus the S&P 500. And yet, with just days to go before earnings season kicks off, one of the most financially sensitive of all major industries is making new highs and conspicuously outperforming the major indices. 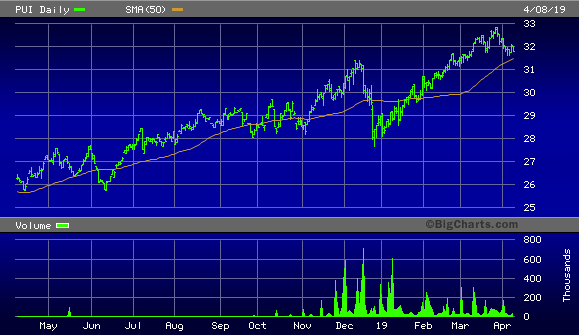 Shown here is the VanEck Vectors Semiconductor ETF (SMH), which completely retraced its losses from last year and made a new 52-week high this week. It's doubtful that the volatile semiconductor stocks would be showing this much strength if informed investors truly expected an earnings-related broad market decline. The combined testimony provided in the above chart examples shows that investors have a clear preference for safety over growth. This mentality is typical of the early stages of a bull market. If we consider that last year's 20% plunge in the benchmark SPX was indeed a bear market, then the recovery which began in late December can be viewed as the start of a new bull market cycle. As such, it's not surprising that investors are still apprehensive over the bull's staying power. From a contrarian standpoint, this is actually good news for the bull and should ensure its continuity over the next several months. Only when we see widespread evidence that retail investors have embraced the bull by shunning safety will there be cause for concern. For now, the strong demand for safety, as expressed by the outperformance in defensive assets and market segments, can be taken as a sign that the "wall of worry" that every bull market needs to climb is alive and well. This negative sentiment ties into the expected earnings outlook this month. For if the upcoming Q1 earnings season produces enough upside surprises, a short-covering market rally is all but certain. Although Q1 earnings are expected to decline by around 4%, the ubiquitous negative sentiment surrounding the earnings outlook paves the way for a major earnings-related market rally. In view of the extremely lower earnings bar that Wall Street has set for Q1, it wouldn't take much for the earnings of some industries to exceed the bleak expectations. We've already gotten a recent taste of how investors will likely react to positive earnings surprises later this month. Last week, stocks rose in response to the U.S. employment report for March. The report took many participants by surprise as nonfarm payrolls report revealed an impressive growth rate, easily beating the consensus. Meanwhile, the most recent data for personal income released by the Bureau of Economic Analysis (BEA) on March 29 showed that income rose 0.2% in February or 3% on a year-over-year basis. As Tim Shirata of Guild Investment Management pointed out, rising income levels correlate with a rising stock market. Meanwhile, the stock market continues to experience strong incremental demand from informed investors who apparently envision brighter prospects for the coming months. 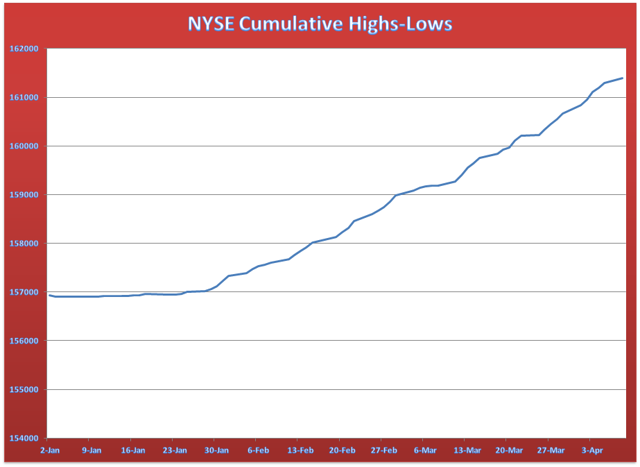 This can be clearly seen in the continued strong performance of new 52-week highs on both the NYSE and the Nasdaq. 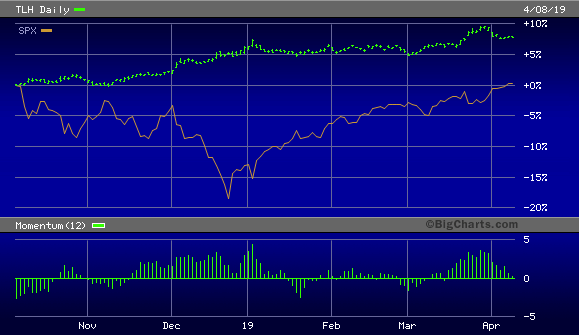 In the last several days, the ratio of new 52-week highs to lows on the Big Board has ranged from 10:1 to 16:1. That's an undeniable sign of internal health and an argument in favor of higher stock prices in the coming weeks. The below-normal level of NYSE stocks making new 52-week lows is further a sign that selling pressure is nowhere to be seen right now. A good reflection of the stock market's internal health can be seen in the following chart. This indicator shows the net rising path of the NYSE cumulative highs and lows since January. On a basic level, a rising new highs-lows indicator tells us that the aggregate path of least resistance for stocks is to the upside. With investors still favoring safety over growth, the stock market isn't in need of another "shakeout" anytime soon since there is not a surfeit of bulls. If anything, the evidence suggests that caution still abounds, and this paves the way for a broad market rally if there are any upside surprises in the upcoming earnings season. With incremental demand for equities having established powerful upside momentum, the path of least resistance for stocks is up, and investors' expectations are very low. Therefore, it won't take much in the way of good news to stimulate a rally to new highs in the major indices this month. On a strategic note, traders can maintain a long position in my favorite market-tracking ETF, the Invesco S&P 500 Quality ETF (SPHQ). I suggest raising the stop-loss to slightly under the $31.50 level for this ETF trading position on an intraday basis. Only if this level is violated, will I move to a cash position in my short-term trading portfolio. Meanwhile, investors can maintain longer-term positions in fundamentally sound stocks in the top-performing real estate, consumer staples, and healthcare sectors.